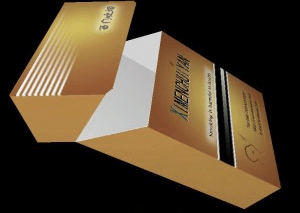 To start the cigarette case design work, usually we need to draw the die line on CAD software and doing graphic design work on photoshop software. For skilled packaging designer it is easy, those work can be done in hours. In this article I’d like to suggest another way for cigarette case design. 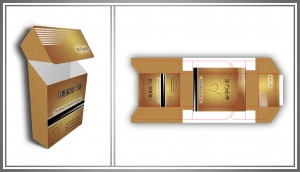 Packmage CAD software is a free packaging design software for corrugated cardboard and folding carton box design. It has a rich box templates library classified as the box material, structure and usages. The first step is to find out the cigarette box template in the library. In Packmage CAD box templates library, all the box templates are listed as 3D folding photo which is much more intuitive for user to find out the box. It will show the die line draft together with half-folding and unfolding photo once user selected one box template. Here we can find out the cigarette box template ID is FE024, then we can click to check the details and open it to modify the parameters such as length, width, depth, caliper etc. Because there’s certain standard of the cigarette case, after the box templates opened you can adjust the size according to your need, here we choose the default value as the standard size, then you can export the file of the structural design. The second step is to use photoshop software for graphic design according to the size of the cigarette case. Save the graphic design with in two JPG format files. Attention: the size of the cigarette case in graphic design should be the same with the one in structural design, when start the texture process in Packmage CAD software, the two files could be matched automatically, you do not have to adjust the size and position. 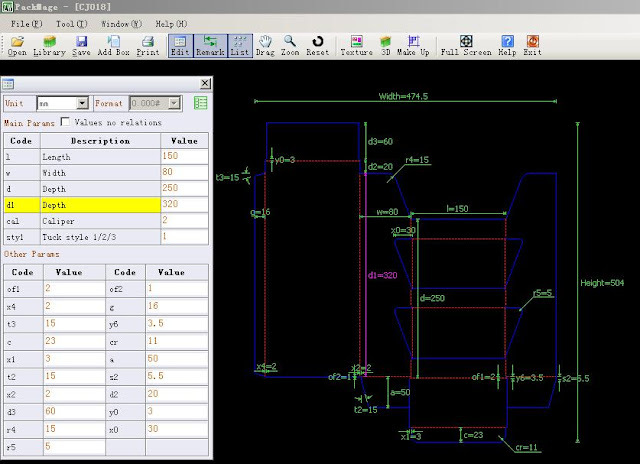 You can take the size in the structural design interface as a reference when starting graphic design. After texture the graphic design together with the structural design, user can check the color sample of the cigarette case in 3D module. Then modify and confirm the graphic design in photoshop software according to the 3D display of the cigarette case. After checked the 3D folding again, the cigarette case design finished, the final design could be the effect list in the following photo. With Packmage CAD software, the designer do not have to be highly skilled, the whole packaging design process is easy and fast. What are you waiting for? Download Packmage CAD software and start your packaging design now.